Bauer & Black, a Chicago manufacturer of surgical dressings, porous plasters, suspensories, chest protectors and other surgical appliances, opened a New York branch downtown on Gold St. around 1901. They had several other locations in downtown New York until moving in 1914 to this building on East 25th St. Bauer & Black was founded in Chicago in the mid-1890s by Louis Bauer, Alexander Bauer, Gustav T. Bauer, and Stephen H. Black. The pater familias on the Bauer side was Louis Bauer (1840-1909), born April, 1840, in Weingarten (Baden), Germany. He immigrated to the U. S. in 1866 and "engaged in the retail merchandise business in Minnesota until twenty years ago [ca. 1889], when he came to Chicago. He entered the surgical appliance line soon after that" (quoting Bauer's obituary notice in the Chicago Daily Tribune, 2 Jan. 1909). He appears in the 1880 U. S. Census living in Chatfield Village, Fillmore County, Minnesota with his wife and 7 children. Among the children are Gustave, age 12, and Perry, age 3. One of Louis Bauer's elder sons, Alexander Bauer (1862-1944) (usually spelled Aleck Bauer), born Dec. 1862, an immigrant from Germany ca. 1867/68, was credited with being the founder of Bauer & Black in his obituary notice in the New York Times, 12 June 1944, p. 19. "Mr Bauer organized Bauer & Black in 1893." He was chairman of the board at the Kendall Co. at the time of his death. Gustav T. Bauer (1867-1927), age 12 in 1880, was born July 1867 in Chatfield, Minnesota. He appears in the 1900 U. S. Census, age 32, living in Chicago, describing his occupation as "Druggist." Stephen H. Black, was born in Iowa, March, 1861. He appears in the 1880 U. S. Census living in Clay Township, Marion County, Iowa, with his father and mother. The Blacks were farmers. Stephen's father, Andrus Black, age 53 in 1880, was born in Ohio, as was his mother, Anne Black, age 54 in 1880. Another of Louis Bauer's sons associated with Bauer & Black was Perry Sidney Bauer, born 30 April 1876 in Minnesota. In 1918 when registering for the World War I draft, Perry Bauer was vice president of the H. B. Lauer Hat Co. in Chicago. In 1928 Bauer & Black were acquired by the Kendall Co. (previously Kendall Mills, Inc., previously Lewis Mfg. Co., previously Lewis Batting Co.) of Walpole, Mass. For more on Kendall, Lewis, etc. see the Walpole, Mass. website. The New York branch of Bauer & Black occupied space in this building from 1914 to 1950. Further down the wall is ANGELUS and INCARNAT / Preparations / LOUIS PHILIPPE Inc. From 1927 to 1930 Louis Philippe Inc. maintained a factory in this building for the manufacture of perfumes and cosmetics (rouge, lipstick, facial creams, etc.). The company was founded in 1911 by Louis Onesime Philippe (born France 1 March 1884, immigrated to the US 1910, naturalized 11 May 1920, died New Jersey 5 July 1959). They are listed in the New York Times 18 June 1915 as a new incorporation, located at 361 Lexington Ave., dealing in perfumes, cosmetics, drugs, chemicals and beauty parlors. In 1928 Louis Philippe made an offering of class A common stock advertised in a detailed display in the NY Times with a history of the company and the following description: "Manufactures and sells the nationally known line of Angelus and Incarnat cosmetics and toiletries, which comprises lipsticks, paste rouges, skin creams, skin lotions, cleansing creams, etc., including the widely known and popular Rouge Incarnat, Angelus Lemon Cream, Angelus Vanishing Cream, Sunrise and Sundown Lipsticks, the trade-marks of which are important assets of the company." In 1933 Philippe sold the company to American Home Products Inc. He continued to serve as a consultant to American Home Products, but also founded a chemical products company called Louangel Corp., a real estate corporation and a wine and liquor business, all located at 312-320 W. 23rd St. Philippe also lived at this address during the 1920s. A photo in the New York Public Library's Digital Collections dated 5 Aug. 1936 shows a sign in the second story window at 316 W. 23rd St. reading Louis Philippe / President / Louangel / Corporation. As of Sept. 2005 the building at this location has a prominent Louis Philippe sign over the entrance (click for image). At the time of his death Louis Philippe was cited in his obituary (New York Times, 9 July 1959, p. 27) as "a pioneer in the development of indelible lipstick." This lid for Rouge Incarnat was sent to me by Lise Lapointe of the Musée Beaulne in Coaticook (Québec) Canada. The Musée Beaulne is a small local museum with a collection of over 30,000 items including clothes, accessories, beauty products, dolls, art works, etc. Visit them at their web site: Musée Beaulne. 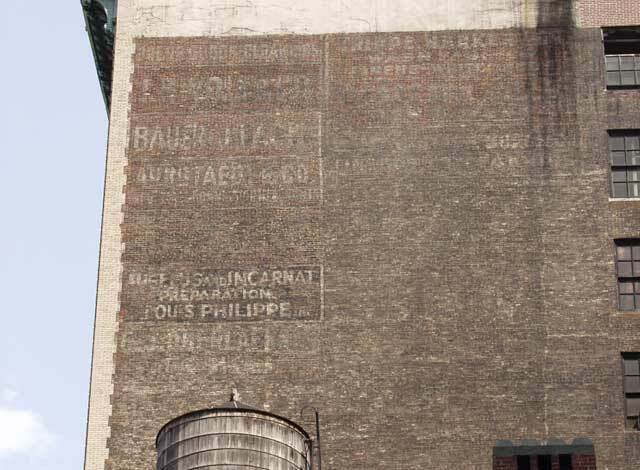 I. S. Wolf & Co.: This sign is immediately above Bauer & Black and dates in the narrow range 1913 to 1916 (click for image). Located on Greene St. for nearly 20 years (1894-1913), I. S. Wolf & Co., silk dealers, moved to 104 W. 25th St. in 1913, then relocated several doors east (to 130 W. 25th) in 1916. The principal owner was Isaac S. Wolf, born in Germany ca. 1860, immigrated 1877. Wolf appears in the U. S. Census of 1930 living in Woodsburgh, Nassau county, age 70, with his wife, Rosa (née Rosa Strauss). The couple were childless. In 1937 Mr. and Mrs. Isaac S. Wolf traveled to Atlantic City to celebrate their 50th wedding anniversary. (This was reported as a social note in the New York Times 24 May 1937 p. 16.) A partner with Isaac Wolf was Jacob Strauss (1874-?). Jacob Strauss was an immigrant from Germany in 1890 and presumably Rosa Strauss Wolf's brother. He was a partner at I. S. Wolf & Co. from around 1904. Jacob Strauss appears in the U. S. Census of 1930 living at 201 Riverside Drive, Manhattan, age 55, and gives his occupation as "Merchant, Tie Silk." Apparently the company specialized in silk used in making neckties during the 1920s and 1930s. I. S. Wolf was renamed Wolf, Strauss & Co. in 1922 and continued under this name through 1925, when the name reverted to I. S. Wolf & Co. I. S. Wolf & Co. stayed in business until around 1939. Arnstaedt & Co.: This sign is immediately below Bauer & Black and dates in the range 1914 to early 1920s (click for image). Louis Arnstaedt (1806?-1877), an immigrant from Prussia, first appears in Doggett's New York City Directory in 1847-48 as a commission merchant at 103 Liberty St. in downtown New York. Similar directory listings continue until Arnstaedt's death in 1877, describing the business as fancy goods, importer, trimmings and hat materials. After 1877 the business was run by Arnstaedt's widow, Henriette Arnstaedt (1816?-?, née Henriette Wilhelmine Karoline Schmidt), a son-in-law, Clement H. Bruel (ca.1850-1892? ), and a partner, Theodore W. Specht (ca.1843-1916). Clement Bruel married Arnstaedt's daughter Emma and lived at the Arnstaedt family home at 134 Second Place, Brooklyn. Bruel died around 1892, and Emma Bruel appears with her mother, H. Wilhelmina Arnstaedt, as a member of the firm in the Trow New York city directory for 1894. Theodore Specht (born in Hamburg, immigrated 1853) later became president of Arnstaedt & Co. and continued in that capacity until his death, 8 Nov. 1916. His obituary notice in the Syracuse Herald, 9 Nov. 1916, p. 3 states "He was born in Germany and came to this country when a boy of eight years. He received his education in the schools of New York and when a young man entered the importing business." Another partner was Louis Duschnes (1857-1917), born Bohemia 1857, immigrated 1870. He started at Arnstaedt & Co. around 1884, eventually became a vice president and stayed until his death 24 July 1917. This description of the company appeared in New York's Great Industries, 1884, edited by Richard Edwards: "L. Arnstaedt & Co., Importers and Commission Merchants, No. 68 Green [sic] Street - ... This concern handles very largely the following goods, in which they are especially strong and known in the market: cloths, velveteens, cloakings, plushes, etc. ... The individual members of this modern and live house are Messrs. C. H. Bruel, T. W. Specht and W. H. Arnstaedt..." The W. H. Arnstaedt refers to Wilhelmina H. Arnstaedt, widow of Louis Arnstaedt. Around 1910/1912 a second generation followed the original immigrants into the company. These included Philip Louis Duschnes (1883-1935), Harry Mortimer Specht (1880-1946) and John William Bockes (1874-1948). Philip Duschnes was Louis Duschnes's son and was the Credit Manager at Arnstaedt & Co. when he registered for the World War I draft in 1918. Harry Mortimer Specht was Theodore Specht's son. John W. Bockes married Clara Louise Specht, Theodore Specht's daughter. At the time of the 1910 U. S. Census the Bockes lived with Theodore Specht in his home in Skaneateles, N. Y. Two subsidiary companies to Arnstaedt & Co. were Glenside Woolen Mills (in business from 1890 until at least 1938) and the Mortimer Manufacturing Co. (in business only in the early 1920s). The Glenside Woolen Mills were located in Glenside, N. Y. and Skaneateles Falls, N. Y. (in upstate New York, near Syracuse). The Spechts and John W. Bockes were owners, and their Arnstaedt offices in New York City served as a marketing outlet for the mill. Apparently, while Arnstaedt was engaged in importing (primarily woolen goods), Glenside Woolen Mills manufactured its own woolen products. The Mortimer Mfg. Co. dealt in automobile accessories. In Polk's 1922-23 New York City Directory Glenside Woolen Mills products are described as "Automobile Fabrics, Under Collar Cloths, Shirtings, Casket Cloth." In the 1925 Polk Arnstaedt is described as dealing in "Casket Makers Textiles, Plushes and Shrouds." For forty-some years (mid-1870s until 1914) Arnstaedt & Co. was located at 68 Greene St. near Broome St. They were located at 104 E. 25th St. from 1914 to around 1922, then stayed in business at two nearby Fourth Ave. addresses until around 1932. Offices for Glenside Woolen Mills survived for another six years at another nearby address: 118 E. 25th St. This advertisement for Arnstaedt appeared in American Wool and Cotton Reporter, March 1919. It says, "Established 1848" and "Incorporated 1908." This advertisement for Arnstaedt appeared in Fairchild's Daily News Record and Women's Wear National Directory, Vol. 17, 1920. This advertisement for Arnstaedt appeared in the Garment Manufacturers' Index, Vol. 2, No. 7, February, 1921. Trippe, Barker & Co. / Wash ... / Linens - White Goods: This sign is at the top of the interior stack (click for image). Trippe, Barker were dealers in dress fabrics, linens and cotton goods (probably mostly imported), and they date from around 1902. They were in business downtown at 73 Leonard St from 1906 to 1914, and their stay at 104 W. 25th St. dates 1914 to 1925. The original Trippe was Augustus Schwaitze Trippe (1875-?). He was born in Maryland 28 Aug. 1875. He appears in the U. S. Census of 1880 as a 4-year-old, living with his father, Edward Richard Trippe (1840-? ), a physician in Easton, Talbot County, Maryland (on the Eastern Shore). A partner with Augustus S. Trippe in 1908 was Barclay Haskins Trippe (1877-1951), who seems to be a distant cousin. Barclay H. Trippe was born 15 Oct. 1877 in Maryland. He appears in the U. S. Census of 1880 as a 2-year-old, living with his father, Richard J. Trippe (1844-1887) in Easton, Maryland. The two fathers were certainly related but not brothers. Barclay H. Trippe has the distinction of appearing twice in the U. S. Census of 1900: once living with his widowed mother, Annie Trippe, at 409 St. Paul St., Baltimore, and again as a lodger in the boarding house of Lavania Short, 220 W. 15th St., Manhattan. Boarding with him at the same address was Augustus Trippe. Yet another Trippe involved in the business was Elvino Dickinson Trippe (1883-?). Elvino Trippe was the younger brother of Augustus S. Trippe, and he was a vice-president in the company from around 1918 to the mid-1920s. The Barker in Trippe, Barker was Lincoln Barker (1875-?) born Massachusetts 13 April 1875. Lincoln Barker was president of the company in the early 1930s after all of the Trippes had gone on to other pursuits. Barclay Trippe had long since returned to Easton, Maryland. He appears in the 1920 U. S. Census living in Easton and gives his occupation as "agriculturist." The company moved downtown to 66 Worth Street in 1926 and stay in business there until the mid-1950s. This advertisement for Trippe, Barker & Co. appeared in the Garment Manufacturers' Index, April, 1920.